As of May 3rd, these materials were received by the White House Department of Energy, BP Horizon Response Center and other entities involved in the spill response. Our concepts are now public domain. 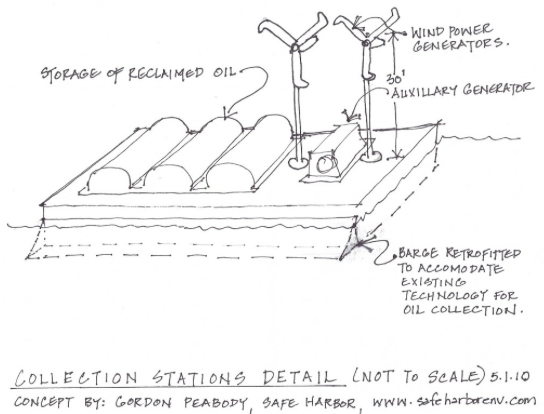 The heart of our system is based on "not chasing the oil with collection systems but using natural forces to guide the floating oil to fixed collection systems. BP, through their Horizon "Call Center", instructed Safe Harbor on May 3rd, to send in a proposal for funding consideration..Strange as it seems, the alternative response technology they are seeking, when it actually exists, as in our innovative concept, must be sold and we are finding nowhere to give it away..
By afternoon on May 3rd, they are now directing all input towards BP's emergency web site...Many of these sites are one way informational web sites. All communications have now been bundled through call centers and handled by emergency response consultants.The leadership has been reconfigured, with the Coast Guard seemingly on the point, and renamed "Unified Incident Command" or Unified Command". "Vessels of Opportunity" are currently being solicited and about 200 have signed up as of May 3rd. Also as of May 3rd, about 50 miles of containment booms have been deployed, with 130 more miles in reserve. Much of the boom line is within the estuary areas, which are connected to the Gulf.